Fit – Blizzard bi-stretch insulated fabric adheres perfectly to the body. The seamless elastic jacquard braces ensure the garment is secure and snug at all times while the GITEvo chamois is ergonomically engineered to the body’s contours. Performance – The high stretch water-guard AcquaZero treatment with grade 4 water repellency and keeps you riding even if the forecast is less than favourable. The Santini engineered GITEvo chamois allows for up to 7 hours of uninterrupted riding. Reflective tabs on the rear of the leg for added road visibility. Comfort – The twist gel core of the GITEvo Chamois provides consistent shock protection. 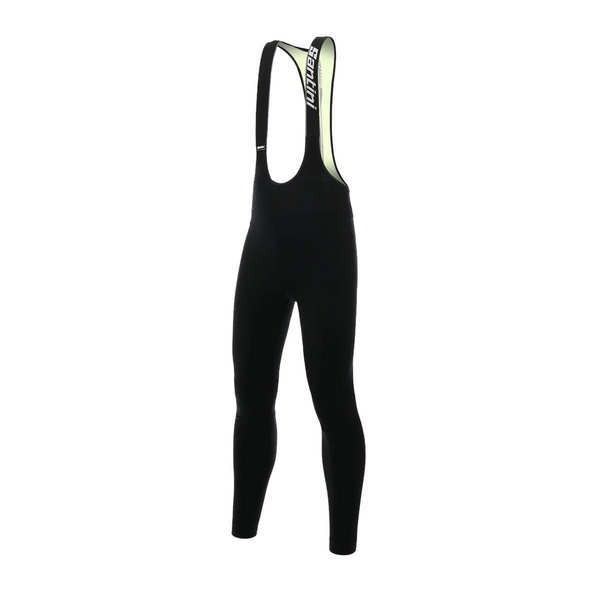 The chamois surface is engineered for excellent freedom of movement, while protecting from chafing and irritation. Elastic jacquard braces provide superior comfort and breathability. Durability – Superb fabrics and ISO-certified manufacturing techniques. Thermal and water-resistant properties are retained even after hundreds of rides and washes. Guaranteed UV- and chlorine-resistance. Completely made in Italy.